In the beginning of the 1970s, a number of Westerners discovered a remarkable Tibetan teacher, Kangyur Rinpoche, living in exile in a tiny house in Darjeeling, India. 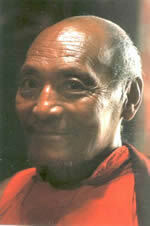 Gradually a group of practitioners formed around this astonishing person. 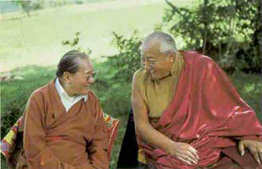 After his death, his eldest son, Pema Wangyal Rinpoche, invited two great lineage holders of the Nyingmapa school, Dudjom Rinpoche and Dilgo Khyentse Rinpoche, to teach in the Dordogne, France. That was in 1975. Over the years they went again and again, to share their unique knowledge and experience with thousands of students from all over the world. Thanks to their inspiration and guidance Chanteloube became a place of meditation where people from many countries and walks of life have completed the traditional three-year retreat. Maitrikara, a branch of Chanteloube, exists to uphold this lineage and tradition here in the UK. For more information concerning the activities of the main centre in France please visit the Chanteloube or Songtsen websites.